6082 56aL 3 Pfg. Dark-orange-brown, block of four with at the bottom attached blank fields, fresh colors and in perfect condition mint never hinged, photo expertize \"genuine and immaculate\" Ströh BPP. Michel 400,- €. 6083 56aUu 3 Pfg. Orange brown, at the bottom unperforated from lower margin, fresh colors and very well perforated, in perfect condition mint never hinged an extremely scarce variety, the also in the Michel special catalogue up to now unlisted is! Photo expertize \"genuine and immaculate\" Ströh BPP. 6084 56cL 3 Pfg. 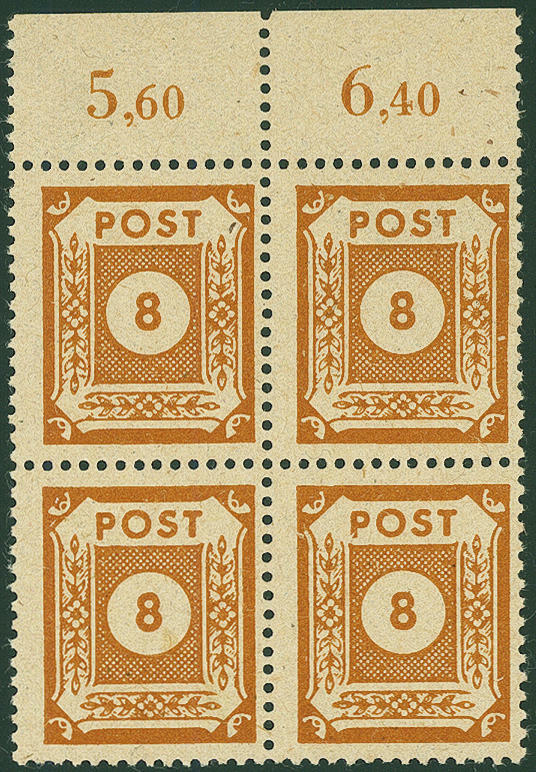 Blackish brown orange from of the right upper corner of the sheet, twice above, as well right with attached blank field, fresh colors, very well perforated, in perfect condition mint never hinged already normal examples this colour are extraordinarily rare. In this kind with same three blank fields a spectacular SBZ-rarity! Photo expertize \"genuine and immaculate\" Ströh BPP. Michel 3200,- €. 6085 57bU 5 Pfg. Blackish olive green, unperforated from left margin of sheet, fresh colors and with wide margins, in perfect condition mint never hinged, very rare, photo expertize \"genuine and immaculate\" Ströh BPP. 6086 58aU 6 Pfg. Dark gray violet, complete original sheet with extremely strong defective or badly placed perforation, through it the lower 10 values unperforated, in perfect condition mint never hinged very decorative and scarce unit! 6087 58aUu,Uo,U 6 Pfg. Gray violet, block of twelve from the left upper corner, as well two stamps at the bottom unperforated, two values above unperforated and two stamps four sides unperforated, in perfect condition mint never hinged very decorative and scarce unit! Photo expertize \"genuine and immaculate\" Ströh BPP. 6088 59b 8 Pfg. Blackish yellow orange block of four from upper margin, fresh colors and very well perforated, in perfect condition mint never hinged in perfect condition. A wonderful unit of this rare colour! Photo expertize \"genuine and immaculate\" Ströh BPP. Michel 3600,- €. 6089 ✉ 60a 12 Pfg. 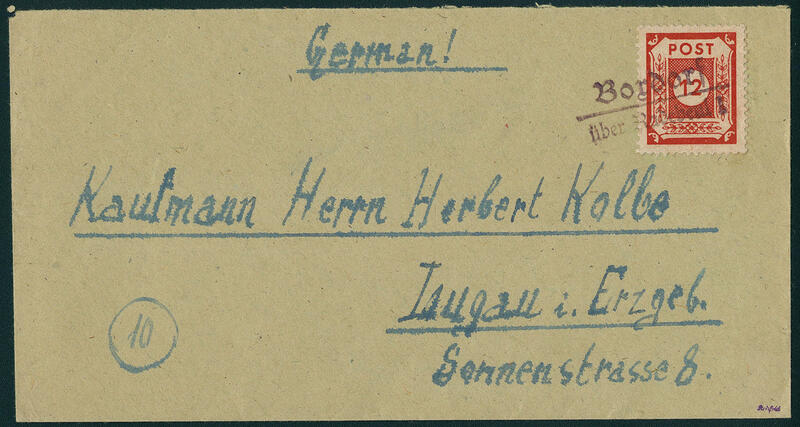 Orange red, fresh colors and in perfect condition as correctly franked single franking on very nice commercially used cover with extremely scarce provisional cancel \"BORDORF over RADEBEUL 1\" to Lugau in the Ore Mountains. Covers with this provisional cancel to class among the SBZ-rarities! Photo expertize \"genuine and immaculate\" Ströh BPP. 6090 ✉ 60a 12 Pfg. 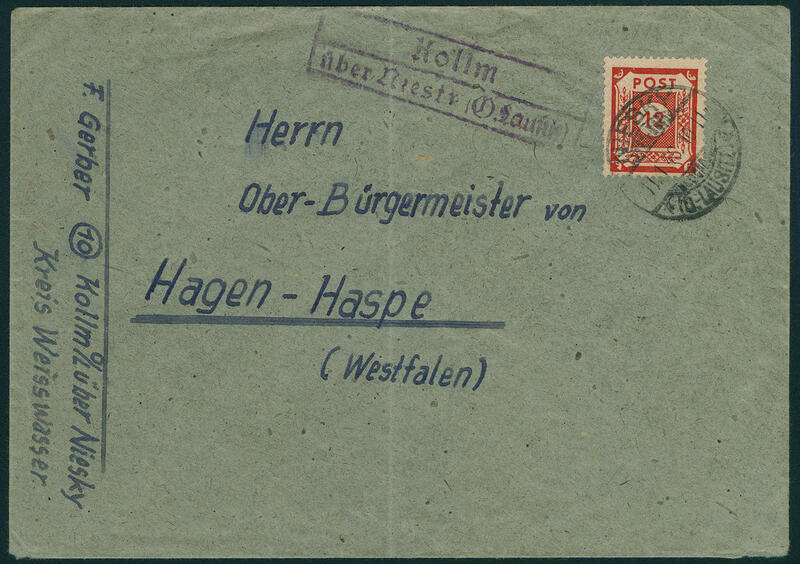 Orange red, in perfect condition as correctly franked single franking on beautiful commercial letter with very scarce provisional cancel \"BOXDORF over WEISSWASSER Upper Lusatia\" with dated postmark \"8. 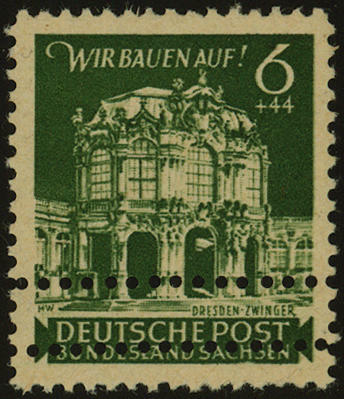 December 1945\" to Berlin. There are only a few letters with this provisional cancel have become known. A SBZ-rarity! Photo expertize \"genuine and immaculate\" Ströh BPP. 6091 ✉ 60a 12 Pfg. 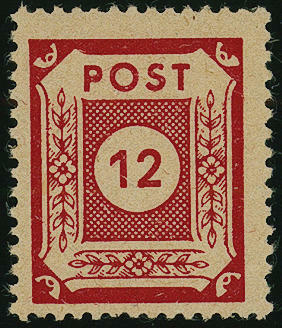 Orange red, in perfect condition as correctly franked single franking on gef. Commercially used cover with postmark \"NIESKY 11.1.46. 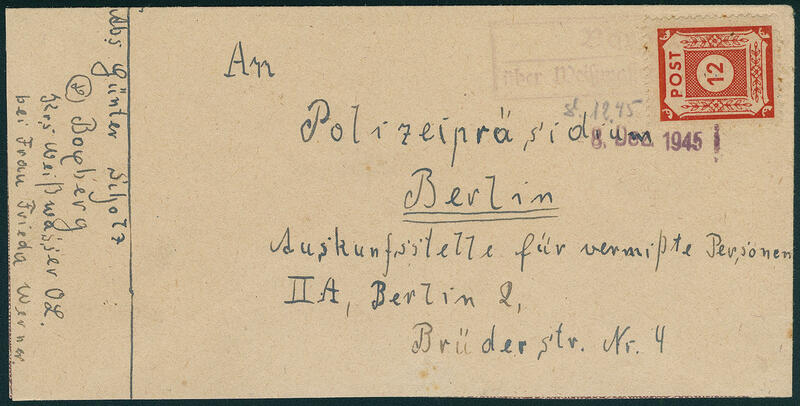 \" and additional scarce provisional cancel \"KOLLM over NIESKY (O. Lusatia) \". Covers of this kind to class among the SBZ-rarities. Photo expertize \"genuine and immaculate\" Ströh BPP. 6092 60P 12 Pfg. Carmine red in lieu of orange red, the very scarce proof, fresh colors, very well perforated, in perfect condition mint never hinged an especially nice copy this SBZ-rarity! Photo expertize \"genuine and immaculate\" Zierer BPP. Michel 1200,- €. 6093 61uAbart 4 Pfg. 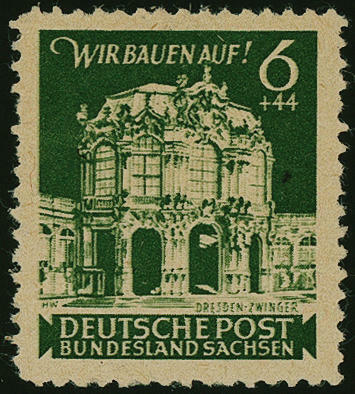 Dark greenish gray in the vertical strip of eleven from right margin of sheet, whereby the fourth stamp from above double printed was. 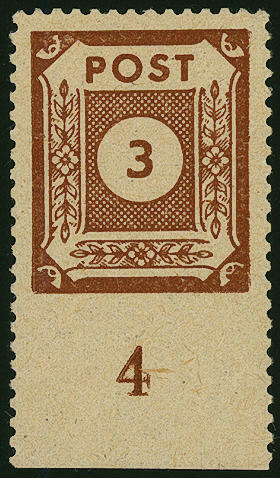 This scarce strip is through miss respectively to arrest the printing machine during of the printing process originated. 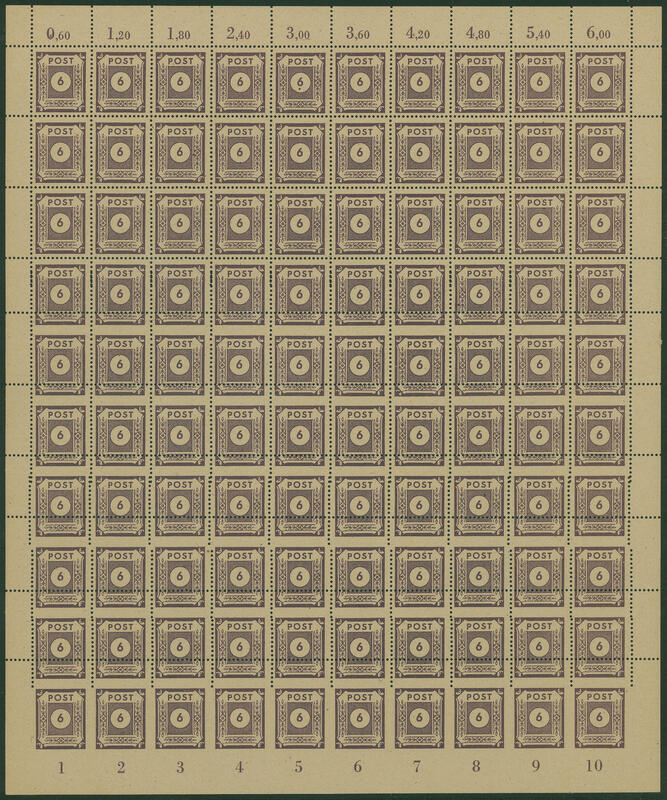 One of the most spectacular Soviet Zone varieties, from which only another copy have become known is, as corner of the sheet unique! Photo expertize \"genuine and immaculate\" Ströh BPP. 6094 61uI 4 Pfg. 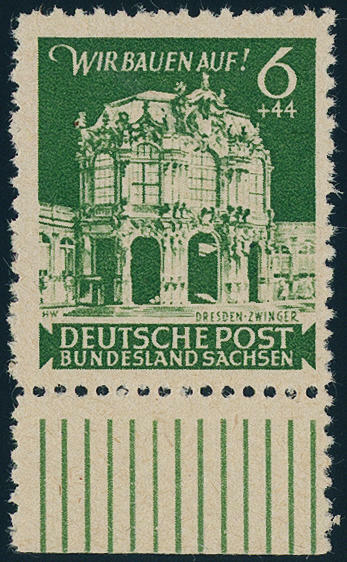 Dark greenish gray, horizontal strip of ten, as well the fourth, fifth and sixth stamp with full centerpiece, fresh colors and with wide margins, in perfect condition mint never hinged such strip of ten with three full centerpieces are very rare. Photo expertize \"genuine and immaculate\" Ströh BPP. 6095 / 61uZSII 4 Pfg. 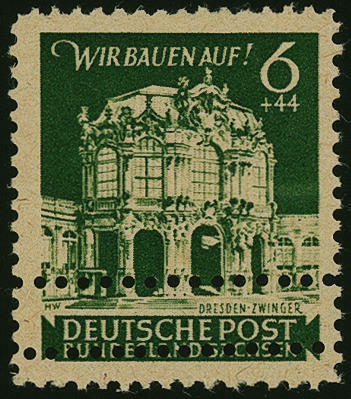 Green gray, two so-called large arch bridges se-tenant from right margin of sheet, fresh colors, as usual in the gutter folded, only on of the gum in of the upper line bar slight affixed spots, otherwise in perfect condition mint never hinged a spectacular unit for the advanced special collection! Photo expertize Ströh BPP. Michel 5000,- €. 6096 63vPa 12 Pfg. Carmine red, horizontal strip of four with glued paper web from right margin of sheet, fresh colors and with wide margins, in perfect condition mint never hinged a very decorative and extraordinarily scarce variety! Photo expertize \"genuine and immaculate\" Ströh BPP. 6097 64aE 6 Pfg. 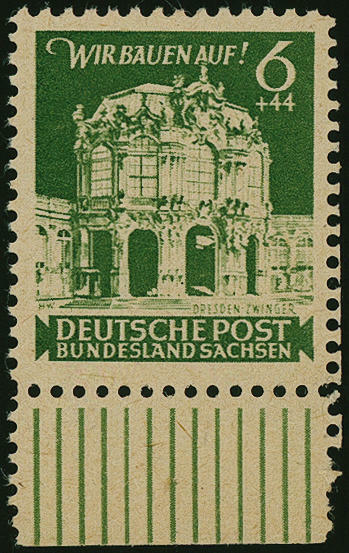 Dark gray green, with the extremely rarely proof perforation 11 1 / 2:11 as well twice with horizontal double perforation 11, wonderful fresh colors and very well perforated, in perfect condition mint never hinged there are only very a few stamps with this perforation have become known. A Soviet Zone rarity! Photo expertize \"genuine and immaculate\" Ströh BPP. 6098 64aE 6 Pfg. Black olive green, perforated 11 1 / 2:11, additional two horizontal perforation row in the perforation 11 by which lower design of the stamp, fresh colors and in perfect condition mint never hinged a very scarce mixed perforation, in this kind especially attractive! Photo expertize \"genuine and immaculate\" Ströh BPP. Michel 1300,- €. 6099 64aF 6 Pfg. 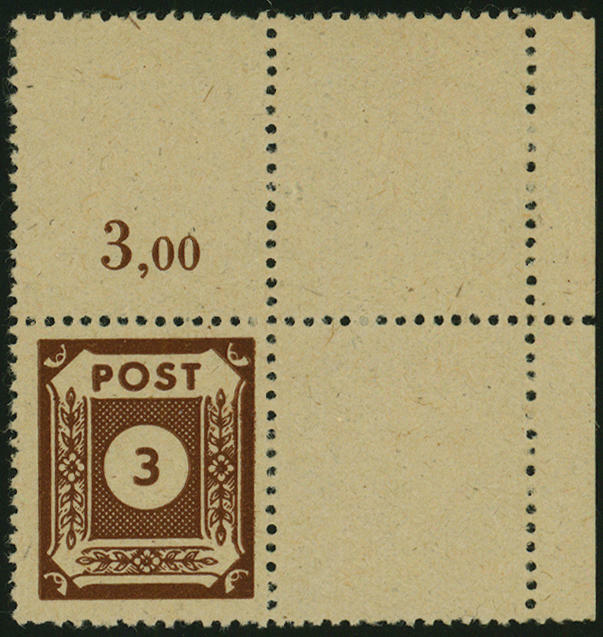 Dark gray green, lines perforation 11 ½ in lieu of 11, fresh colors and in perfect condition mint never hinged at the perforation 11 ½ is a proof perforation, of the only a few copies became known are. Photo expertize \"genuine and immaculate\" Ströh BPP. Michel 1500,- €. 6100 64bC 6 Pfg. 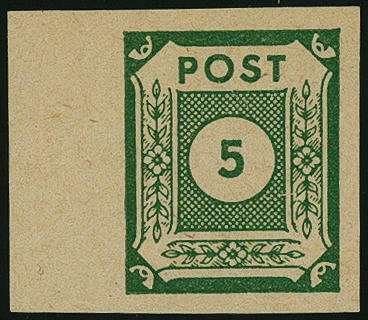 Dark green olive, perforated L11:11 1 / 2, fresh colors and in perfect condition mint never hinged from lower margin. 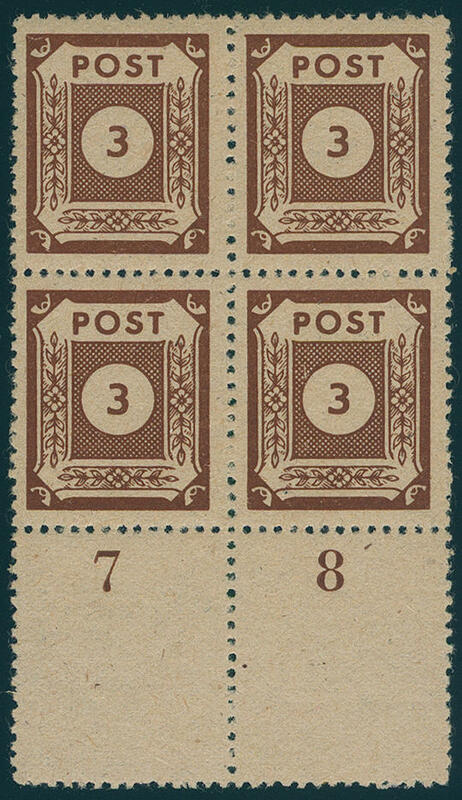 A very scarce mixed perforation! Photo expertize \"genuine and immaculate\" Kunz BPP. 6101 64bF 6 Pfg. Dark green olive, perforated L11 1 / 2, fresh colors from lower margin, in perfect condition mint never hinged a scarce issue! Photo expertize \"genuine and immaculate\" Ströh BPP.